Do you have the tools to make a viable investment? It doesn’t matter what you do for a living…whether you are an individual, educator or a professional investor, you need to understand the basics of stock fundamentals and its role in making wise choices when investing in the stock market. Making an informed investment decision requires thorough securities research. And in the stock market – just like any business – there is ebb and flow. Stocks have periods when they can bring in good profits, and other periods when it’s more challenging to make money. For the wise investor it’s about understanding the fundamental research from an experienced securities research company. And you can do that with quality stock charts. Stock charts can assist you in helping understand how a company has performed in periods of expansion and periods of recession. There are several reasons why securities research is paramount before making any investment, and why you should consider using a securities research firm to help you make money in any economic cycle. First, DJIA Stock Charts give you the foundation for understanding how the overall market has performed during many economic cycles. And it helps you understand the overall market before investing in individual stocks. Securities research can be a significant undertaking, but with the right tools, it can be fairly easy to understand. And it doesn’t take much time to get up to speed. By understanding the history of the DJIA, you gain insight that many investors lack. So how do you do you go about understanding the DJIA? DJIA charts can provide at-a-glance synopsis of thousands of data points in a single picture. The mind instantly grasps a picture far better than scrolling through the raw data. With a DJIA chart, you can see how the market has performed in past economic periods, giving you insight and perspective about the market’s ups and downs. Where do I find reliable source? Many stock research companies just provide you the stock price and volume and don’t give you the underlying fundamentals. There is a common saying that goes, “stock prices always follow earnings”. So understanding the correlation of earnings and stock price history over time gives you a base knowledge that “stock traders” may not have. This approach can give you an edge in the market. Becoming an expert in any field takes time and it’s no different with investing in the stock market. Many people just prefer to leave their investment decisions to a professional advisor, but even if you do, you still need to understand the basics of how stock market works. Securities Research Company has an 85-year history of helping to doing just that. 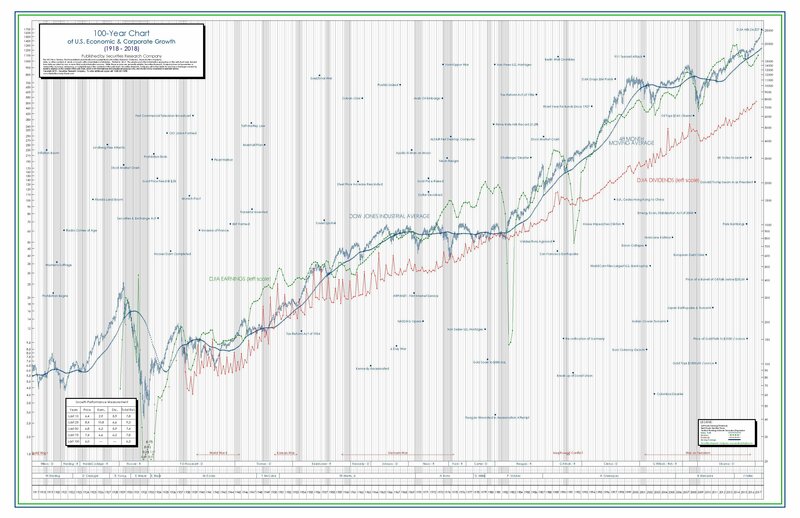 Securities Research Company provides the information to understanding the DJIA for the past 100 years – as well as 5,000 stocks over various time periods: from Daily to 50-year charts. Whether you prefer to receive your stock research information in print or online, Securities Research Company has you covered.